Life jackets are more than just basic kayaking accessories. They are built to save lives. So, whenever you take your yak to the waters, it’s important to make sure you’re wearing a well-made life vest. Unfortunately, most people don’t take this advice seriously. But if you’re reading this, it’s a clear indication that you’re determined to take good care of yourself. In that regard, it’s our duty to provide you with the best kind of advice possible. As it turns out, no two or three kayaks are made equally! Basically, you want to settle for a kayak that’s well-made, comfortable and secure. Other than that, keep the following factors in mind. Now, without further ado, we’d like to present you with a full list of some of the best life jackets for kayak fishing. Hopefully, you’ll find something that’s not only affordable but also user-friendly. The sheer variety of life jackets on the markets can make the task of finding the best match a tad difficult. But thanks to our latest reviews, you can catch up with a run-down of the best alternatives at your disposal. The table below is all yours for you to explore. 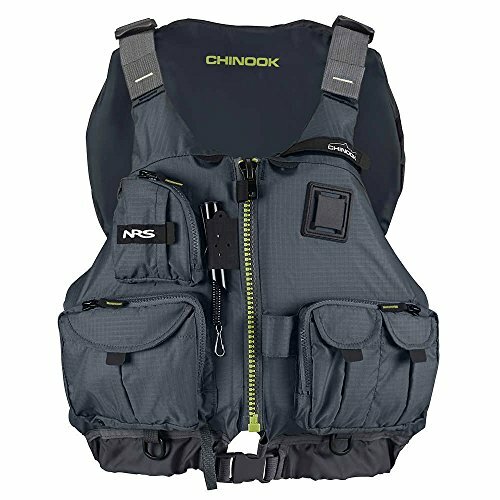 NRS-Chinook is a life jacket perfect various water activities including fly fishing, kayak fishing, and other water sports. The jacket is 6" high, 23"wide and has a design flotation of 16.5 lbs. It is made from a nylon material that is blended with other materials for a utility and comfortable life jacket. The jacket is designed to conform to your body. The front has eight adjustments points for a custom fit. In addition, it is quite roomy and has a zip. The jacket has a mesh lower back, for ventilation when it is hot. Other features include a key lanyard, D-rings and attachment loops for attaching various accessories, a strobe holder for low light situations, a coil tool retractor for clipping tools. It also has a knife lash tab and rod holder loops. 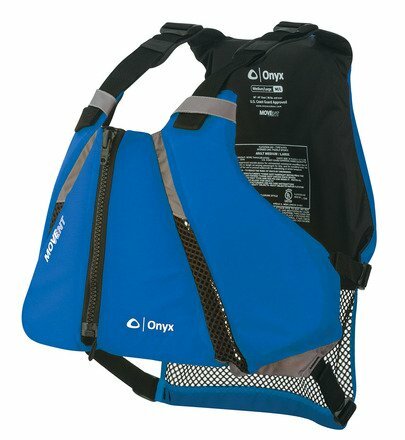 Onyx-MoveVent Life Jacket comes with various safety and comfort features for a good kayaking experience. First and foremost, it is designed to have a perfect fit on your body like a glove. The jacket comes with vented channels to keep you cool. The jacket also has durable zipper closures, and a zip assist loop to secure the vest. It also has an adjustable side belt. For your comfort, the jacket has adjustable neoprene shoulder pads, and the inner back has bubble form. In addition, the jacket has extra-large zippered pockets which have mesh drainage. Besides, the jacket has a drying loop on the back. Further, a whistle is attached to the jacket for use during an emergency. Various sizes are on offer to choose from. 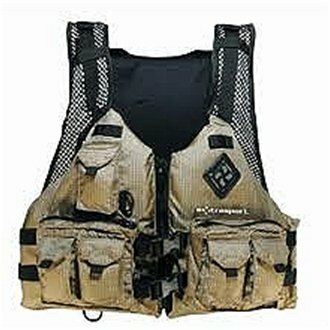 M MAXIMUMCATCH-Maxcatch is a perfect vest to be worn when you are out fishing. 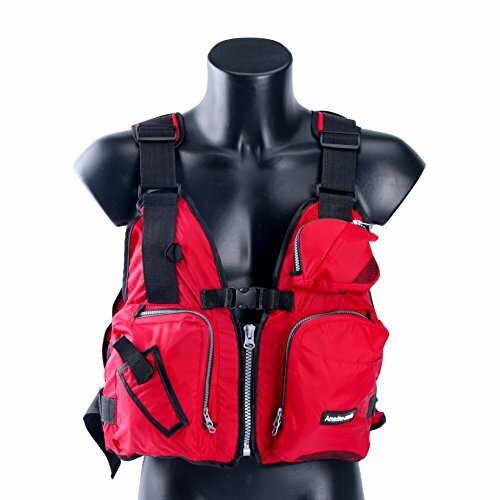 It is a two-in-one product working as both a vest and a backpack. The vest is lightweight and is constructed with a water-resistant fabric. It also has a mesh to keep the air flowing and keep you cool. It is adjustable to fit all sizes of people. 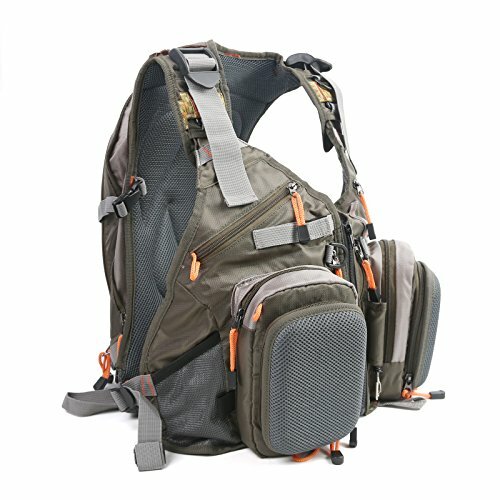 The vest/backpack has two main molded pockets and three main expandable zippered compartments. One size fit all, always works against very small sized persons or very big sized persons. ONYX Fishing Kayak is designed with utility, comfort, and safety features. The jacket has numerous pockets to keep your gear and personal items. It has four pocket designs. The pockets include a chest pocket, a drop-down tray pocket, zippered pockets, and a large mouth cargo pocket. The drop down tray pocket can hold a small size sized tackle box. In addition, the jacket has six adjustment straps. Other features include a safety whistle and a lash tab which serves as a knife holder. 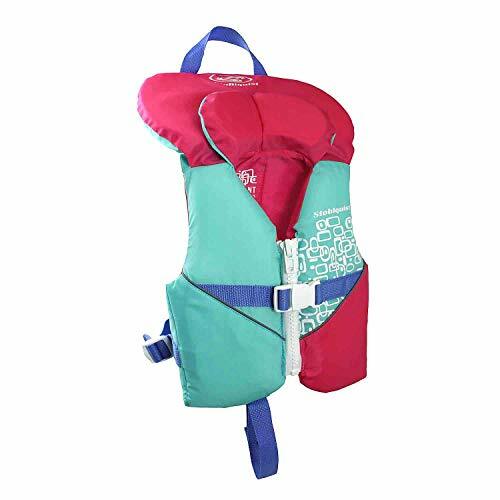 Stohlquist Toddler Infant is a secure and comfortable jacket for your infant and toddler designed for type II PFD. The jacket is approved by the USA Coast Guard and is good for kayaking, fishing and other water activities. The jacket is designed to allow free freedom while making your baby safe. It has a buoyancy weight of 7lbs. The jacket has a front zipper and adjustable straps for easy wearing. It also has a quick release security buckle for a perfect fit. In addition, it has an adjustable strap and a convenient grab handle. ONYX MoveVent Curve is a type III jacket approved by the USA Coast Guard. The jacket conforms to the rider’s body like a glove providing comfort and mobility. The outer shell has a 200 denier nylon which is a soft and lightweight material with flotation foam. The inner back has bubble foam and flotation foam plus. In addition, the jacket has neoprene shoulder straps. The jacket also has adjustable side belts and the reflective SOLAS grade material. The front of the jacket has ventilation. The mesh lower back fits in sit-on-top kayaks and high back seats and makes it ideal for kayaking and other water activities. Stohlquist Waterware Fisherman life Jacket is made from nylon. The outer shell has a 500 denier, and the liner has a 200 denier oxford. The jacket has neoprene padded shoulders. The lower back has a waistband and open sides for ventilation. The jacket has ample storage including an anti-spill pocket that is padded, and EVA stiffened. The life jacket is easy to maintain. It is simply handwashed with soap and water. Amairne-made is a budget life jacket designed to fit persons less than 250lbs. The form is made from EPE and Detachable EPE foam plastics, while the upper material is a 600 denier nylon and waterproof Terylene Oxford. The jacket is designed with many pockets. It is fitted with a crotch-strap for safety which prevents the jacket from being removed easily. 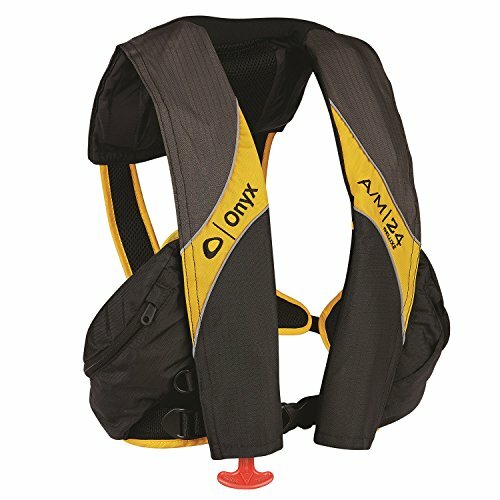 Onyx Absolute Outdoor is a USA Coast Guard Approved Type V PFD inflatable life jacket loaded with many features. 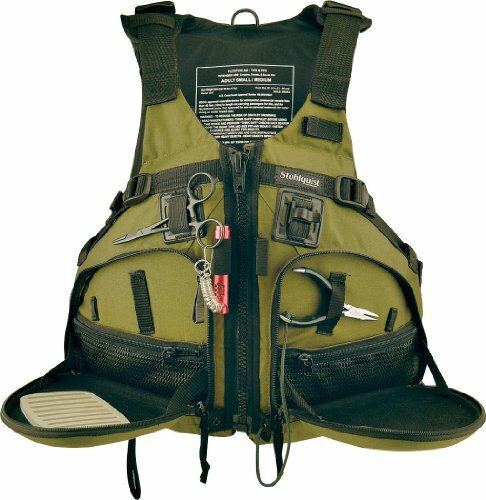 The life jacket is made from heavy-duty 420 denier nylon ripstop and 400 denier nylon. The jacket has a manual pull cord for inflating the vest and therefore is convertible from automatic/ manual to manual only inflation. The jacket’s neckline is constructed from soft neoprene for comfort. The jacket comes equipped with enough pockets, including a fleece-lined sunglasses pocket. You can use the pockets to safely keep your camping tools, waterproof camera, fishing gears, and personal items. In addition, the jacket has air mesh for ventilation. 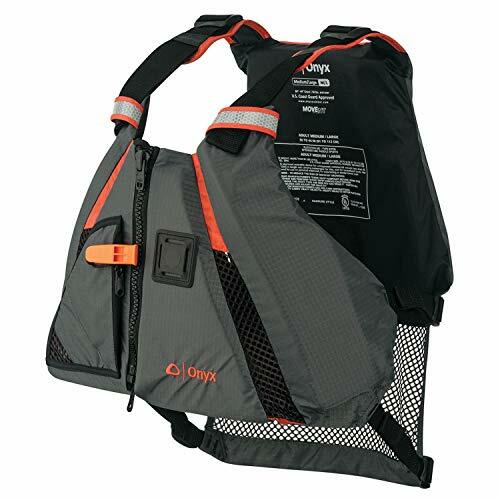 Extrasport Osprey Life Jacket is a type III PFD life jacket approved by the USA Coast Guard. It is a foam vest with a front zip, security buckles, and wide armholes. The wide armholes are for free mobility. The jacket has seven expandable pockets for storage of personal items and fishing gear. In addition, it has other holders and attachments points for your tools, keys and other items. It is fitted with adjustable mesh shoulder straps for a customizable fit. The jacket is designed with a thin back to enable a comfortable ride in canoes and kayaks. 84% of individuals who drowned on California waterways were folks who never bothered to wear a life jacket. Remember, these jackets aren’t just meant to help you float on water. Most of them a brightly colored and can play a major role in helping rescue teams and other boat users find you. So, indeed, the benefits of these jackets go well beyond the usual ones. But the question remains – are you using the right life jacket? Well, if you’re not too sure, here’s a guide that will help ensure you have the right protective gear with you. An adjustable jacket is probably the best bet, especially when shopping online. Their unique design allows for a proper fit since you can always make adjustments to accommodate different body types. Be cautious of free-flying jackets as they can easily cause you to lose balance and increase accident chances. If you can get a life jacket that has been duly approved by your local coast guard, you’d have a lot more confidence in it. Basically, you’d be much safer if you opt for a made in America PFD. In other words, don’t just focus on cutting the cost. You don’t want to do that only to end up compromising on your safety. It’s better to pay a few more cents for great quality. As far as universal size and fit are concerned, you can choose from three variants. The small-sized jackets range from 28 to 32 inches in size. Medium-sized jackets range from 32 inches to 36 inches. Large ones range from 40 to 44 inches. So, you basically need to select the range that seems like a perfect fit for you. The overall design and layout of a life jacket may vary depending on the gender it’s designed for. Therefore, be sure to check on this all-important factor before you place an order. Women’s life jackets, for instance, are best if sculpted to fit your curves. They should also have some supportive cups meant to accommodate your body. Pink, purple, and orange are just but a few of the popular color choices for women. Ultimately, no matter your body type, you’d be better off going for an adjustable life jacket. This way you can tighten or loosen it according to your unique needs. Traditional the orange color has been the most common color type for PFDs. However, this color has been overshadowed by other variants thanks to the advent of hand-made life jackets. But all in all, you’re better off settling for bright and reflective colors. Orange and fluorescent green as just but a few of the awesome choices at your disposal. You can also, always find camouflage colors among other color ranges depending on your unique preferences. But ultimately, we’d recommend settling for bright and reflective color variants. Yet another way to look at PFDs is by considering the kinds of materials used to make them. The nylon material is the most common one and that’s probably it is cheap and waterproof. Nylon is also pretty light in weight making for a comfortable alternative for anyone looking for a bit of comfort. Then there’s neoprene. This is found in pricier vests. In fact, it’s mainly used in skiing and kneeboarding gear. That said, you can still enjoy using it for kayaking if you can afford it. One unique benefit of neoprene over nylon is that it tends to offer a higher level of buoyancy. It’s also much more comfortable and snug fitting compared to nylon. Although it’s not advisable to have your kids accompany you on dangerous kayak rides if you want to bring them on board, make sure they’re well protected. A good jacket, in this case, is one with at least a simple zipper and 2 buckles. Now that we have exhaustively discussed all the kinds of factors to consider when looking around, we’d like to make a verdict. 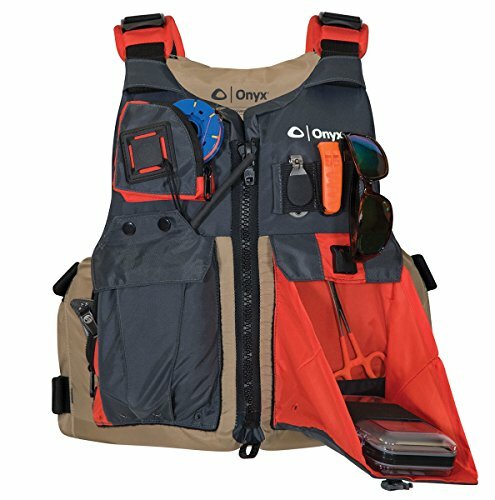 Overall, we think that the Onyx-MoveVent Dynamic Sports Life Vest is a sure bet. That’s because it’s designed to perfectly fit different body types as it’s available in different sizes. What’s more? It has lots of pockets that you can use to keep your precious devices. Besides that, it comes with a free whistle that you can use to call for help in case you need it. 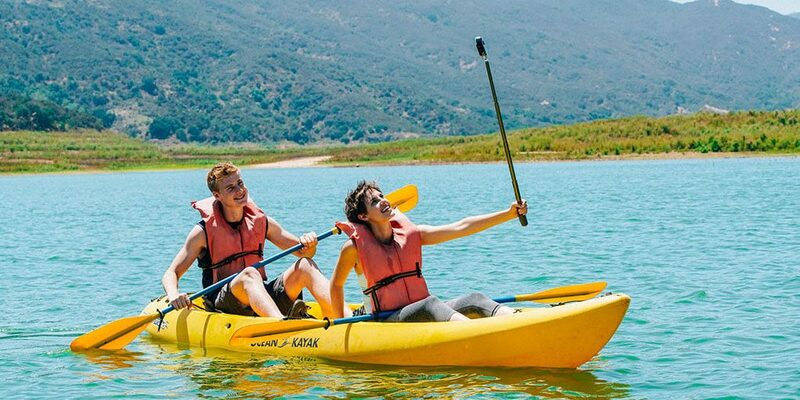 In our opinion, the first rule for kayaking should always be – safety first. So don’t compromise on this. Indeed, it’s our hope that the reviews and buying guide provided above will help you make an informed verdict.